I love playing Zuma Blitz on Facebook – I think it’s way more fun than Bejeweled Blitz. It’s a very carefully constructed game that I’m sure monetises very well as a result; well worth studying if you want to see a shining example of a competitive social game. Recently they added a Daily Spin option where you can win mojo. Mojo is required if you want to use powerups which are great fun and often increase your score. 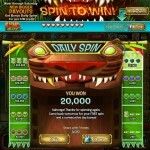 You get one free daily spin and can buy more spins for Facebook credits. I’ve never bought any extra spins but this week there’s a promotion on where you can get extra spins for just one Facebook credit and also the payouts are much higher than normal. You can buy 100,000 mojo for 90 gold idols, and you can buy 100 gold idols for 19 Facebook credits. A little maths tells me that 90 gold idols (for 100K mojo) costs 17.1 Facebook credits. I decided to burn 20 Facebook credits in an experiment to see how much mojo I could amass and if I could get MORE mojo this way than from buying it the normal way. It’s easy to think that the payout is truly random, but I bet it is not – it should be carefully balanced to be a bit more than you would get buying it the normal method. It should be pointed out that buying extra spins is actually a bit slow as each spin requires multiple clicks and delays whilst your Facebook credit is spent. It would be way better if you could buy a whole bunch of spins at once. So it feels a bit like “hard work” getting mojo using this method. Buying mojo the normal route gives you 5847 mojo per Facebook credit. Doing the Daily Spin gave me 10600 mojo per Facebook credit. So roughly double the normal amount. Of course I could try again and get all 4Ks and 8Ks, or maybe some crazy high amounts. Based on this I might do another 20 spins before the promotion runs out as it does seem like a cheap way to get mojo. If you try it out, let me know how you get on! You are currently browsing the Grey Alien Games weblog archives	for September, 2011.